Raj Niwas - People Nivas for responding/ensuring Justice/ for all 24x7.. 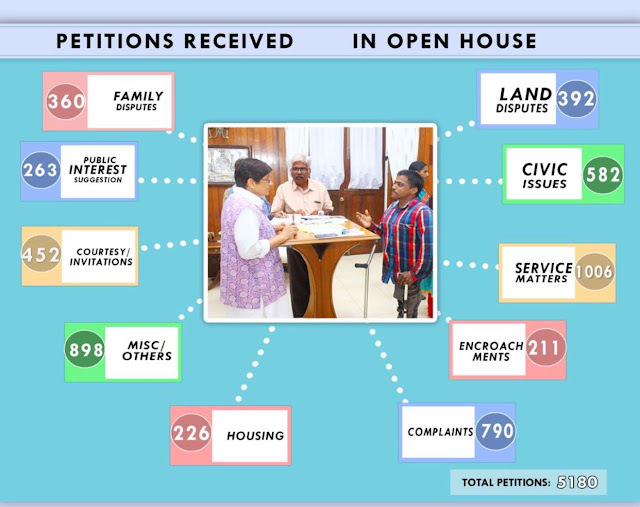 The Open House connects the common person with all departments of government without any obstruction. It gives him/her a right to be heard. And ask for action even in matters repeated. This is right to information directly excercised. It empowers the poorest to know his right at the same time across the table. It also enables the LG office to help petitioner Connect with the right official as he sometimes does not know who to approach. One of the biggest benefits to Administration of this Open House is evidence of corruption in various areas, be it Medical seats, high mast lights, public works, places of entertainment, service matters etc. This has enabled bring about a watch on corruption. The ball is in the court of people now to use PeopleNivas to the maximum to reduce corruption and promote probity in services. There is no outsider please. Please accept the criminality which has happened. CBI would not register an FIR of this scale without credible evidence. to take responsibility for this colossal failure and embarrassment to Puducherry. I have no doubt that the CBI will investigate whose instructions officers were carrying out. Unless the officers want to protect others. Alongside is the role of the CS for failing to ensure due coordination between the departments for effective corrective action. Such as Education and Health and more. It's a case of failure of political and administrative leadership at all levels. Had the parents association and the students not repeatedly complained and informed the MCI, and the Lt Governor's office not intervened, had the Government of the day paid heed to the Report of the Justice Chitra Venkatraman's report listing out all that went wrong, had the MCI not taken strong action, and had the PIL not fructified and Honorable Madras High Court not passed clear order, and had the SC not declined to stay the pleas of private colleges, injustice would have prevailed. It's not any outsider who has caused this failure. It is all from inside leadership. It's is the primary failure of the CM, the Minister/s and the CS. Even Officers of the rank of Secretaries/ Director will not easily indulge in such mass scale criminality, getting widely reported in media. The blunder they committed was that they carried out wrong verbal orders, perhaps nowhere placing them on record. Which is why they are now responsible and the Prime accused in the FIR filed by the CBI. They shall all have to defend themselves before the court of law for years to come at their own expense. Their careers will be severely affected. Hence they need to tell the truth as to whether they were committing these irregularities on their own or were being directed to and by whom? If they do not tell the truth now they will suffer for the rest of their lives. Speaking the truth is their only chance to explain. Long awaited, The Field Mantra has come. 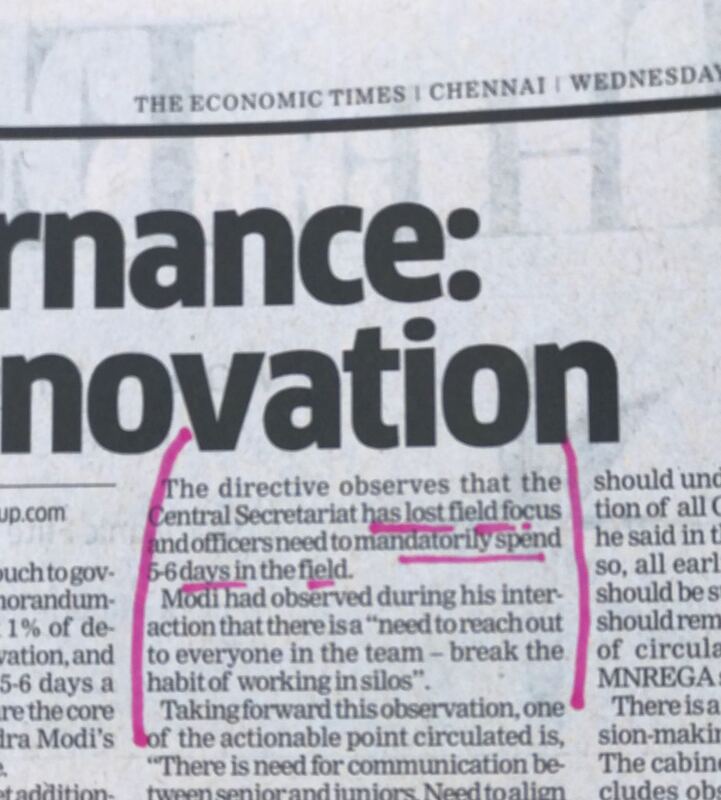 PM's directive observes that the 'Central Secretariat has lost field focus and officers need to mandatorily spend 5-6 days in the field'. That there is a need to reach out to every one in the team --break the habit of working in silos...There is a need for communication between seniors and juniors. Need to align all employees to the vision of the organisation'. Once all supervisory officers in Government implement this directive in letter and spirit governance will reach the common man with speed and service. It is the intention which will matter. Not make it a routine visit for record sake. Or a paper report. But a visit which has a purpose and leads to improvement in the place of visit. Thereafter follow up is essential to see if improvement has happened. Visits will encourage team solutions and alignment in functioning as PM's direction intends to inculcate. 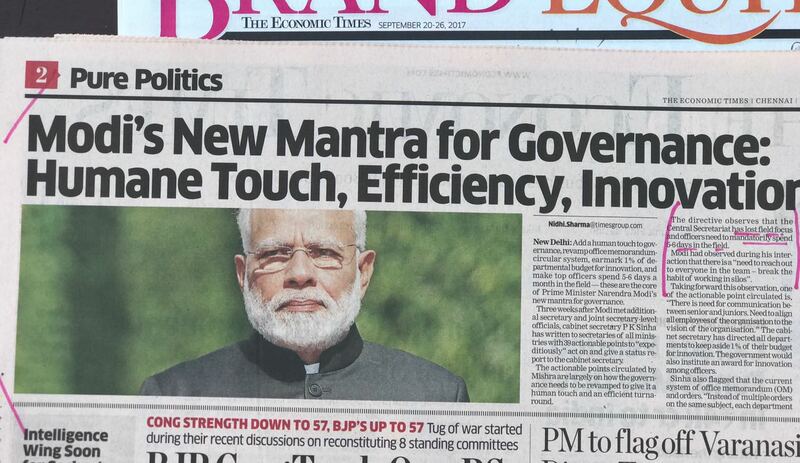 Am happy to see this directive finally come from PM himself. I have been requesting this from day one. 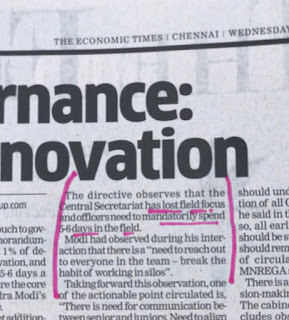 Once Puducherry officers follow it, it will improve every sector. Most of all it shall stop wastage of precious resources. Governance delivery is both TopDown and BottomUp. There is a visible disconnect between the Top, through the middle and then the bottom. Delivery is hampered by several layers. Whereas the implementation is by the middle and the bottom levels. New India needs newer strategies to narrow this gap. There are no mandated strategies to do so. It has been by and large person driven at various levels so far. Which is why few stand out others remain invisible or remain average, or do not feel accountable or stake holders. 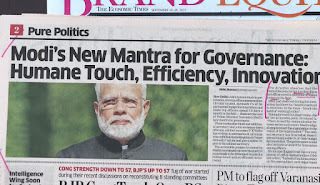 For a New India we need a nationally implementable plan to coopt all the 3 Crore+ Govt employees. Some States, Some officers, some places, some units doing it will be like ponds or small islands but not make the Indian Ocean, of responsive delivery.